Rationalist Judaism: What Does One Say At A Time Like This? Someone asked me if I am going to be writing a post about the kidnapped boys. Like everyone else, I am consumed with worry, sadness, despair. But what's there to actually say? I did draft a lengthy post about which responses classical Judaism maintains to be of help and which responses it does not maintain to be of help. But I was very, very uneasy about posting it, so I sent it to two very different people for their opinion, and both strongly advised me that now is not the time for such a discussion. I'm not going to say what I think the IDF should do, because I'm not qualified to have any opinion on the matter, and what I say is in any case of no consequence. I'm not going to sound off with criticisms of the Israeli government, or of the US government, because I don't see any point, and after reading "The Prime Ministers," I realize how different things are when you have to negotiate international politics. I'm not going to post a hashtag "#bring our boys back", because I'm not personally convinced that that is a meaningful or respectful way to express solidarity, although I understand that others feel differently. And I'm certainly not going to post a "selfie" of me holding a sign with that message. So what's there to say? Perhaps it is simply important for everyone to give public voice to their distress, and to add to raising global consciousness about the situation. (See this article by Shoshana Keats-Jaskoll for an articulate expression of the public mood.) Like everyone else, I am in anguish, and I hope and pray that our boys will return home safely. And I wish much strength and success to our troops that are working so hard, under such difficult and dangerous conditions, to get them back. Well said. When emotions are heightened, it is neither the time for theoretical halakhic discussions nor for knee-jerk outcries for revenge. Do you say Tehillim or is that irrational? Not if you find meaning that is appropriate for the situation, if said as a mantra it's irrational. Those who can do something about the situation should do it. Those who can't should turn to our Father in Heaven and ask for His help. Such a time, such a time. Most of the _200 young girls_ who were kidnapped _two months ago_ are still missing. I still have a picture relating to the girls on my Twitter, FB, and G+ pages. 'He spoke about our commitment to stand up for each other. The girls in Nigeria and the boys in Israel, he said, will never be found, unless every person in the world sees them as their brother, sister, daughter or son. G-d created man singularly, he preached in the name of the Talmud, so that no person can claim superiority over another human being. Yes. We remember. And we care. #1 If not now, when? Well said. Or rather well refrained. The media is so desperate to have things to say that they are at best scraping the bottom of the barrel and at worst having insultingly inappropriate discussions. One professor I heard interviewed on the radio castigated the media and exhorted them to only discuss things they would be comfortable sharing with the families of the kidnapped boys. Sensitivity is not a strength of the media outlets. So well NOT said. I appreciate your decision to refrain from a lengthy theological analysis while the crisis is ongoing, but I hope that at some point in the future you will share your thoughts on this issue. I am very uncomfortable with the slew of "add a mitzvah" or "say this perek of tehillim" campaigns that are being circulated as a method to help the kidnapped boys. I have trouble with the notion that Gd will directly intervene in the hateful actions of individuals because people put a few extra pennies in the pushke, or say an extra bracha. I would really appreciate your educated, considered thoughts on the topic, when the emotion of this particular even has subsided. I think that precisely asking people to do small things is effective--if we would ask them to say a half-hour of Tehillim or give large amounts to tzedakah, people would feel like it's burdensome. This way, by having many people each do a small act, the total amount of tzedakah or Tehillim being said will also be substantial. Maybe some critics can find it in their hearts to be grateful that Israel maintains an army which is going to the ends of the earth to find the boys. If that's not praiseworthy, then nothing is. How about a post contrasting how the Charedi world handled this abduction vs the way they related to the Gilad Shalit abduction http://www.rationalistjudaism.com/2011/11/nothing-to-gloat-about.html . If Chareidim only care about their own community why did many of the Charedi gedolim order that Tehillim be said even on Shabbos? What was different this time? Is the fact that they were frum the difference or is it because they were Yeshiva students? What does this tell us about the Chareidi community's relationship with the Dati Leumi? Would Chareidim recite Tehillim if one of the Dati Leumi gedolim were sick? Ephrayim, save the cynical comments for another time, okay? We need something else right now. Take a look in the mirror and you might realize that it is your own attitude that makes you understand my remarks as cynical. If anything I think an analysis would reveal that Chareidim actually do care about people beyond their own kind; contrary to what seems to be the tone here generally. Ephrayim raises an important question. Why indeed is the charedi community more involved in davenning for these boys than they were for Gilad Shalit? The differences are probably that (a) these boys are much younger, making the case even more tragic, and (b) these boys are not in the IDF, which would have made a barrier against charedim to express care. Or maybe because there were questions about Gilad Shalit's mother's Jewishness? I don't believe the concern in the charedi community is dependent on whether the person being abducted is a soldier or not. I remember when Nachshon Waxman, hy"d, was kidnapped, we had very big prayer services here in Ramot (The Waxmans live in Ramot, Jerusalem.) . It culminated on the Shabbos night of the deadline that Hamas gave--both the Chassidic and Ashkenazi sections of the central shul here in Ramot Dalet were packed. I think that there wasn't such a reaction for Gilad Shalit among the charedim, because it was clear that he wasn't in any mortal danger--quite the opposite: he was something very valuable to Hamas to get back as many prisoners/terrorists as possible, and it was clear from videos that he was all right. The whereabouts and status of Shalit were not known until a year after his capture. Also, the yeshivah students in Japan were not in mortal danger. Then maybe the determining factor could be whether the person involved is observant (like the Waxmans), or just "traditional" (like the Shalits). I still think it's a factor that Hamas threatened to kill Nachshon Waxman if their demands weren't met by 8 PM Friday. We never heard such a deadline with Gilad Shalit. haomdim bein bayam uvein bayabasha. Our brothers are the whole family of Israel. History has shown in the last several decades that it seems that every time we are at each other's throats, something terrible happens. I recall the first "intifada" (I hate the fact that Israelis adopt the Arab name for their violence against us!) occurred after the inflamed Shabbat demonstrations in 1987. While disagreement is legitimate and it is fair to clarify our positions, we can't let these conflicts degenerate into hatred. I have to work on myself regarding this. Regarding the kidnapping of the girls in Nigeria by the Muslim Boko Haram terrorists, I am very disturbed by that and am outraged by the general indifference of the world and the how PC princes of "human rights" are ignoring the horrors that they are committing. Anshel Pfeffer wrote in Ha'aretz how the new slogan is "Never Again 'Never Again'"!....meaning that after World War II, the world said "Never Again will the world sit back and allow horrors like the Holocaust". The new attitude is "don't bother us with the Never Again nonsense, we want to be left alone". In other words, the world is returning to normal, the post-War attitudes against Holocausts were a temporary aberration. I am encouraged by one thing coming out this....Israelis now realize that WE CAN ONLY ULTIMATELY DEPEND ON OURSELVES! and that "security guarantees" from people like Obama and Kerry are WORTHLESS. What would be the situation if there were still 100,000 Jews in Iraq and tens of thousands more in Syria, where we see minorities groups being slaughtered wholesale. We must be grateful for the ability to defend ourselves after two thousands years of being helpless victims of atrocities like these Muslim fanatics are carrying out. I agree that there is little to say except to pray for the best (as it's clear that anything in the way of force is being explored by the IDF, Mossad, etc.). Since you mentioned "The Prime Ministers," though, I must express my surprise at your reaction to it. My reaction was almost the exact opposite. I found it extraordinarily depressing how much Israel's leaders in the past have cared what America says. Even when discussing capturing Yerushalayim in 1967, all the Cabinet ministers could think of was "What will America say?" Of course, if one believes that Israel's fate rises and falls with America, then one has to care about America. But if one understands that Israel is a powerful independent nation that has a G-d in heaven who can help her anyway He pleases (for example, through Stalin in 1948 and through France until 1967), then one starts caring a lot more about what G-d wants and much less about what America wants. Yes, politics is complicated -- but only because Israel makes it so. If a country is a grasshopper in its own eye, then it sees itself as a grasshopper in the eyes of everyone else who desperately needs help and protection. 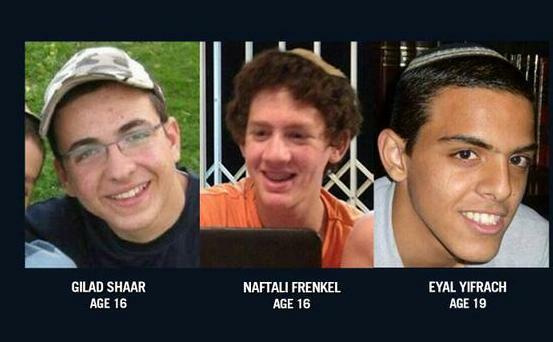 To end with the matter of this blog post, may G-d protect the three young teenagers. At least when it comes to kidnapped Israelis, I think both Right and Left are basically on the same page as to what should initially be done. May they succeed gloriously in finding and rescuing the three young men. And may the young men be unharmed. How do you know that America is not the means through which God is helping her? And either way, isn't diplomacy reasonably part of our histadlus? Yes, politics is complicated -- but only because Israel makes it so. If a country is a grasshopper in its own eye, then it sees itself as a grasshopper in the eyes of everyone else who desperately needs help and protection. This seems to be a combination of wishful thinking and sympathetic magic: If we imagine something, it will be true. If we imagine otherwise, reality will change. I don't think that 's what the pesukim mean. In practical terms Israel is a small country of 8 million people in a sea of potential enemies. Diplomacy is important. Think 1973. Arthur R. is correct, IMO, that this is all part of us doing our part and not depending on miracles. It's not wishful thinking. It's like the kid who is scared of a bully in school until one day he actually stands up to the bully and realizes that he actually has little to be sacred of and that most of his fear was of his own invention. Tell me, how did Israel, which was far weaker in 1948 and 1967 than it is today, survive back then without America? What makes you think that Israel coudn't survive without America today? Because it gets 5% (not more -- look up the numbers) of its budget from America? Besides, America supports Israel because it gets something out of it. It gets intelligence and the menucha in knowing it has a democratic ally in the midst of the Middle East. It also get much business from all the high-tech companies that have bases there. It is naive to believe that America supports Israel out of the goodness of its heart. It's a two-way relationship that America would be very loathe to break -- whether Israel listens to it when it comes to its security or not. Does China listen to America when it comes to human rights abuses? Does that affect their relationship? Finally, if you read Tanach, it's clear that we Jews are not supposed to place our fate in the hands of the nations. The prophets criticize us for this many times. I'm not saying that one shouldn't be diplomatic and play the game of politics. I'm saying that the first consideration should always be: What does Hashem want and what's good for Israel? To have the opportunity to reconquer the Old City in 1967 and to discuss almost exclusively (as described in "The Prime Ministers") what America's reaction will be is symbolic of a very timid and dependent mind. It should be pointed out that in the run-up to the declaration of the state in May 1948 the Americans and many other influential people were recommending to Ben-Gurion that he consider delaying the proclamation of the state to a more 'propitious time'. He refused even though he knew it would lead to a war. Had he not done so we never would have gotten the state because there was a rare conjunction at that point in time that brought the US and USSR, the two most powerful countries in the world, to support the creation of a Jewish state. A few weeks later, the democratic government of Czechoslovakia was overthrown in a pro-Soviet coup and the Berlin blockade began, all of which lead to the Cold War which lasted for 40 years. From that point on, the USSR would have automatically blocked any American initiative to support a Jewish state (or vice-versa) and the widespread international consensus would have evaporated. Ben-Gurion made the bold decision to proceed and history proved him right and Israel got weapons which the US refused to supply from the Soviet puppets in Czechoslovakia. Also, in 1949 Ben-Gurion pushed through the law proclaiming that (West) Jerusalem would be an integral part of Israel and its capital, in direct defiance of the UN Partition Resolution and the international community which insisted that Jersualem was a "Corpus Separatum" and not part of either the Jewish or aborted Arab state envisioned by the Partition Resolution. This was a time when there were fewer than 1 million Jews in the country and in desparate need of internation aid. Nobody did anything about it. Thus, we see that bold, far-sighted action in Israel's interest that even go against the wishes of the international community have succeeded brilliantly. Ben-Gurion said "what matters is not what the goyim say but what the Jews do". He, better than most, understood the importance of diplomacy and certainly didn't neglect it, but he, at the same time, had the vision to realize that vital decisions have to be made while often disregarding "world opinion". History has proven over and over, that when Israel decides to go ahead with controversial policies, even against "world opinion", the world eventually accepts it , even if reluctantly. Analogies with anecdotes about schoolyard bullies are not very strong support for any argument. America is a democracy. It supports Israel mostly because of the Jewish influence on American politics, the support of many Christians who see a religious significance in Israel's existence, and the general sympathy among the populations for democracies and anti-Arab sentiment. You aren't going to find that in Russia or China. China has 1.3 billion people and the strongest military in it's sphere of influence. I trust that Israeli leaders will not take their lead from China. To the degree that the US overlooks their human rights problems (and it doesn't completely do so), it is mostly due to the fact that Americans don't care or are not focused on China for the most part, its limited ability to make a difference, and it's desire for cooperation with other issues considered "more important" like cooperation on North Korea. I'm sure this is much more complex than I'm making it here due to my ignorance, but my point is that analogy is weak. I didn't read the "The Prime Ministers" so I can't dispute your assessment there. But psychologizing foreign policy to product of "timid minds" seems like a weak way to analyze the issue. I certainly hope that those who are in charge of Israel's security act prudently and with deliberation, at the risk of seeming "timid". i must agree with david ohsie. a close relative of mine has a high level job in us dept of state. he says that most analysts in state dept and in us military are not very pro Israel at all. they see little benefit in the intelligence sharing. according to him, the pro israel position of the usa is because in a democracy, elected officials make the decisions, and congress and presidents need the votes and support. it would be prude for israel to avoid angering usa or embarrassing its president. these prime ministers were skilled leaders and politicians and built a fine state in an extremely short amount of time. id defer to their judgement even it wasn't always perfect. I believe there would be strong support for Israel in the US even if the Jewish population was much smaller or less influential. American support for Zionism began in the 1830's (yes, in the 19th century) long before there was any signficant Jewish population in the US. This is why Obama can't openly break with Israel even though there is no doubt in my mind that he really loathes us, for example, it must have killed him to have to veto an UN Security Council Resolution condemning Israeli YESHA settlement policy. This is why Republican Presidents gave support (possibly reluctantly) even though Jews overwhelmingly vote Democratic. Jews are only 2% of the population of the US and this is declining rapidly. There has to be a strong reservoir of support for Israel in the general population. I think that there would be support, but it would certainly be lower. It is true that Jews vote overwhelmingly Democratic, but they also influence with political contributions which I think are sent to both parties. Also, the politicians are looking at marginal votes, and the Jewish vote does vary and so can be influenced by policy. Yes, Jews are 2% of the population, but have a larger influence due to high voting percentages, great over-representation in political donations and in the "intellectual/legal/political class" and concentrated concern of the Israel issue. I do fear that this influence will be lost as we assimilate and also lose the emphasis on political awareness and donation. The reason the US doesn't make an issue of abuses in China is because it gets too much from China to make it an issue. My point is the same regarding settlements. The USA gets too much from Israel to break with it over settlements (and related issues). And I very much disagree with you about Yerushalayim. When you have an opportunity to capture the Old City, you should jump at it. Even if there's a discussion, the discussion should include how terribly important Yerushalayim is to the Jewish people. The way Yehuda Avner remembers the cabinet discussion, all anyone could think about was, "What will the world say?" That's pathetic, small-minded thinking. And let me end with one of my earlier points. The prophets often criticize ancient Israel for relying on alliances with Egypt and Assyria. We'd be wise to take this exhortation to heart.